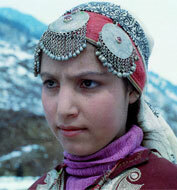 Kashmira is a young orphan girl who lives with her uncle in Kashmir. She earns her livelihood by using her pony Kesari to ferry luggage on the hilly terrain. She loves nature and remembers her parents by the trees she has planted in their name. When young Mohan and his farther come to live in the neighbourhood, Mohan is impressed by Kashmira’s fortitude. He begins to dislike his father’s job who takes contract jobs to cut trees. Inspired by Kashmira, Mohan also plants a tree in his mother’s name. Meanwhile Kashmira’s cousin Ishtaque has nefarious plan of his own. Sukhdev Ahluwalia joined the film industry in 1955 as an assistant camera man, working with Modern Studios and Raman Productions before switching over to writing and direction. A prominent filmmaker from Punjab, over the last four decades he has written and directed many films including ‘Do Sher’, ‘Dharamjeet’ ‘Taakra’, ‘Jai Mata Sheron Wali’, ‘Kunwaara Mama’, ‘Til Til Dalekha’ (that won Punjab State Govt. award for best story in 1979) etc. He has also made dozens of video films.